Random House Books for Young Readers, 9780553533736, 320pp. Fans of the Land of Stories and the Descendants series are sure to find the lighthearted fantasy adventure of 100 Dresses a perfect fit! Inside an enchanted castle, there’s a closet—a closet with one hundred magical dresses that only Darling Dimple can wear. Each one disguises her as somebody else. It turns out that Darling needs disguises. A thief is on the loose! Someone is causing an uproar among the servants—moving things around, stealing clothes from the laundry, and even pocketing Princess Mariposa’s jewels. Then Darling and her friend Roger think they spot a ghost roaming the halls. Could the culprit be a spirit? Can Darling and Roger get to the bottom of it all? 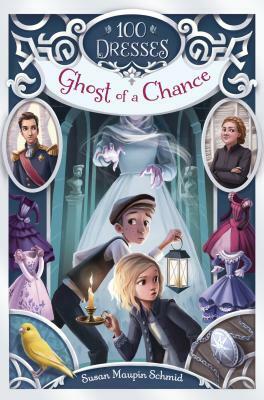 With the help of the one hundred dresses, there just might be a ghost of a chance. Susan Maupin Schmid is the author of 100 Dresses: If the Magic Fits. She grew up next to a cemetery. She never saw a single ghost. Not one. But she did have a favorite tombstone: Princetta Blakely’s sparkly black granite monument. Susan liked to imagine what life would be like with such an amazing name. And she read books. So many that she exasperated her local librarian. When her parents built a summer home by a lake, she pocketed a library card at that library. Through the years, Susan has continued to read, imagine, and collect library cards. To find out more, visit SusanMaupinSchmid.com and follow her on Twitter at @maupinschmid.